(10:50 a.m. EDT) -- Long known for its land tours as well as river cruises, Tauck is in the midst of a small-ship growth spurt, with plans to double chartered sailings over several years (there's a 40 percent increase in 2019 alone). For most of its small ship cruises, Tauck has partnered with Ponant, a luxury French line itself in a growth spurt, with two expedition ships launching this year and four more coming before 2020. 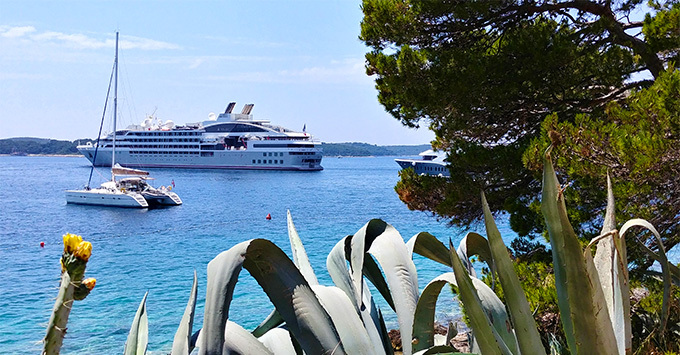 Cruise Critic is onboard Ponant's Le Lyrial, to experience a full-ship Tauck charter of the cruise line's one-week Croatia sailing. The experience is a bit of a hybrid, marrying Tauck's all-inclusive approach to cruises and tours with Ponant's decidedly French flavor. It's also different than other small ship cruises because the onboard and shoreside parts of the trip are run by separate entities. Tauck does not own its own ships, either on the open seas or on the rivers (although the river ships do bear Tauck logos and branding). Instead, the line charters ships with longstanding partners, such as Scylla on the rivers and Ponant on the ocean. The long-term relationships give Tauck the ability to influence the onboard experience and ensure a high standard of accommodations, meals and service. At least that's the idea. Onboard, if you run into a problem related to the ship, Tauck has supplemented its team of Tauck Directors, who sometimes can't help with ship-related issues, with a new crew position: the ship liaison, who not only takes care of arranging all the shore tours but serves as a go-between for Tauck passengers and the ship's crew. You can also reach out to Ponant's guest services manager with a problem. On full charters, she or he is at your full disposal; on partial charters it can be a bit trickier and you're probably better off going to Tauck's liason. While Tauck does partner with a few different lines for its small ship cruises, the majority of its offerings are made in partnership with Ponant, with which Tauck has been working for more than 25 years. In 2018, Tauck will use seven Ponant ships (none holding more than 275 people), including the line's two newest ships, both launching in the second half of 2018. Charters of the ship are either partial -- about 60 to 80 people -- or full, although Tauck is trying to offer more of the latter. 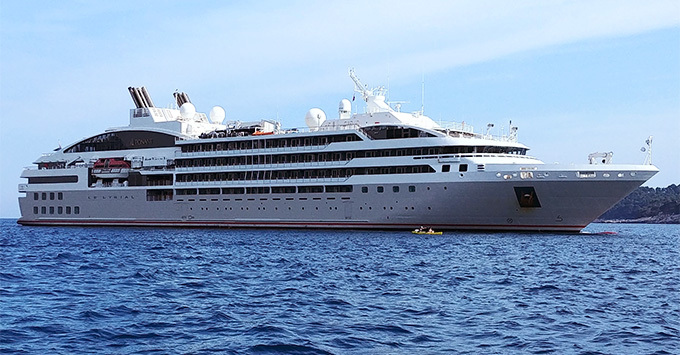 The company's first full Ponant charter took place in Japan this spring; two of the six Croatia sailings that Tauck is offering this year are also full charters. In 2019, there will be even more. A few things to know about Ponant: The ships are lovely, sophisticated yet comfortable, with a full-service spa and salon and small gym and swimming pool. Service is French; the crew hails from France, the Philippines and Indonesia, with varying degrees of friendliness. If you're on a partial charter, most of the Ponant passengers will also be French, and they do not tend to mix with cruisers from Tauck, which caters almost entirely to Americans. The food onboard is also heavily French; expect lots of creamed dishes, words you don't recognize and, if you have any type of dietary restriction, be sure to ask for a full description of each dish as all the ingredients aren't always listed. Similar to what you'd find on Tauck land tour or river cruises, almost everything is included on a Tauck small ship cruise; from shore excursions and drinks (soft and alcoholic) to all tips (no need to tip the tour guides!) and internet. Spa treatments and professional photos are the most common extra onboard expenses. The inclusiveness is one of the main reasons you'd want to book through Tauck instead of directly with Ponant; while it's slightly cheaper to do the latter, only drinks are included in the price. All excursions, internet and tips are not included with Ponant. 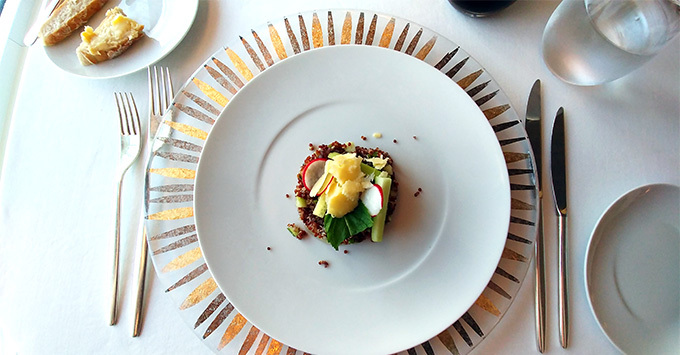 One caveat to the above: While breakfast, lunch and dinner are always available on the ship at no extra cost, you might find yourself on your own for meals during the pre-cruise portion of your Tauck trip, even once the official "tour" has started. On the day we boarded Le Lyrial (technically the first full Tauck day), we had two tours, one to Murano and one to Burano, with two hours allotted for lunch on our own on Burano. Restaurants on the island were crowded and expensive, leaving some guests a bit miffed. This is different than what you'd find on a Tauck river cruise, where guides often give you money to buy your own lunch. On our seven-night cruise, a total of 38 excursions were offered -- all included in the cruise fare. With choices ranging from classic city tours and gastronomic- or wine-themed tours to kayaking, biking and hiking, there's something for everyone. Each port of call had at least four or five tours to choose from, and there are always multiple departures of the line's classic tours (usually a city walking tour is the most popular). None of the tours, however, were specifically reserved for slower walkers -- something Tauck river cruisers might be used to, especially in European cities where the streets might be cobblestone or there are hills. It's also common to have more than one excursion a day -- sometimes in two different ports, other times in the same city. (A tour in Kotor, Montenegro, for instance, was divided into two pieces -- a city tour in the morning and a trip to an island church in the afternoon.) Excursions on our sailing were always led by excellent local guides -- we didn't have a single mediocre guide! One of our favorite aspects of Tauck's port visits has been their length. With just a couple of exceptions, we always arrived in port in the morning and stayed until early to mid-evening; on several nights we stayed late -- 10:30 p.m. in Korcula and 11:30 p.m. in Dubrovnik, for example. People took excellent advantage of these late-night stays to dine in town, explore by street light and just see how the locals live after many of the tourists have disappeared for the day. The later stays not only give people the chance to experience the ports at night, it gives each day a wonderfully unhurried feeling. From its inception, Tauck's concept of touring has always centered on small groups. Just as it does on its river cruises, Tauck always has at least three tour directors to take care of the passengers ashore; on full charters, there's usually six. Each is well-versed in the ship's destinations and can provide advice on where to eat and sites to see that might not be included in any of the ship's tours. Many have also educated themselves on the history and culture of the destinations; some so much so that they'll often offer a lecture during the course of the cruise. However, with so many tour directors on a single sailing, the quality of their knowledge will vary and it won't take long to see which ones garner the most cruiser attention. Another facet of Tauck's tours are lagniappe: little surprises that are usually cool experiences that weren't on the printed itinerary. On our sailing, this materialized in the form of an included gondola ride in Venice, as well as a surprise lecture by a local guide from Dubrovnik who talked of his personal experience during the five-year siege of the city by Serbian and Montenegrin forces during the war of 1991 to 1995. There was also a surprise performance by a local folk dance troupe in Montenegro.